For those that count their engine size in CCs and crave the rush of wind on your face, consider these motorcycle-touring routes in Colorado, where nothing separates you from the outdoors. These 10 scenic rides are favorites with motorcyclists. For more, view the quick guide to Colorado's Scenic and Historic Byways. As the highest paved road in North America, the Mount Evans Road rises to a height of 14,130 feet above sea level. Begin your trip in the historic mining town of Idaho Springs. From town, travel south on Highway 103 to the junction of Highway 5, the entrance to Mount Evans Road. Groves of pine trees first greet you on this section, but gradually give way once the timberline is breeched. Riding along the exposed mountainside, you'll get a magnificent view of glacier-cut valleys and a seemingly endless horizon of sharp rocky peaks. Mountain goats and bighorn sheep are often seen grazing roadside. Be aware: The guardrails disappear up here, so caution is advised as you traverse the switchbacks to the top. (Read about other famous Colorado peaks). 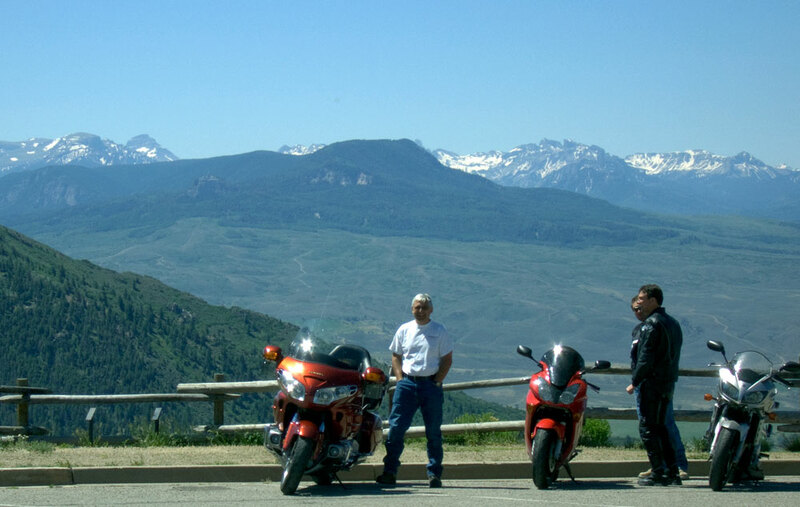 One of the best ways to see Rocky Mountain National Park is on a motorcycle. Mount Evans Road may be the highest paved road, but Trail Ridge Road Scenic and Historic Byway is the highest paved road in the United States that doesn’t dead-end. The grandeur of rocky peaks and lush blankets of pine trees accompany you through this route. Keep your eyes open for grazing elk, bighorn sheep and other animals — they're common visitors to the roadside and surrounding cliffs. The ride combines straightaways with twists in the road that showcase all aspects of the park's beauty. Tundra with brush no higher than a few feet is a contrast to the granite peaks of the Rockies that loom like immovable giants. The original Santa Fe Trail carried pioneers and traders hundreds of miles over the prairie to points west during the 1800s. The trail is still in use today, but as the Santa Fe Trail Scenic and Historic Byway, taking travelers through a history-laden slice of Colorado. At certain points, you can even see the wagon ruts of original pioneers winding their way through the prairie grasses. This route is almost completely straight and is a relatively easy, though longer, drive. Midway on the trip sits one of Colorado’s most significant and historic treasures, Bent’s Old Fort National Historic Site. Originally built in 1833 as a trading post along the Santa Fe Trail, it became a cultural meeting place. This route also takes you through the Comanche National Grassland, where the land still grows the original prairie that the pioneers saw when forging through the plains. Mountains here look as if they were painted. Crimsons bleed into purples and grays with vibrancy nearly unmatched by other peaks. The San Juan Skyway traverses multiple mountain passes that each rise more than 11,000 feet above sea level. The towns that you'll pass through on this route are renowned for their history and beauty. Both Telluride and Silverton are rich in mining lore, and Cortez and Mancos stand at the entrance to perhaps the best Ancestral Puebloan site in the nation, Mesa Verde National Park. On the San Juan Skyway you can ride on what’s known in Colorado as the “Million Dollar Highway.” This specific stretch runs from Ouray to Silverton. Sights of Mount Wilson, Mount Eolus and Mount Sneffels — some of the highest mountains in the United States — also showcase their grandeur from roadside vistas. This section of highway played an integral role in World War II: The uranium used in the country’s first atomic bombs was mined near Uravan, the midway point of the Unaweep/Tabeguache Scenic and Historic Byway. There’s more history here than just the A-bomb. Precambrian dinosaur and amphibian fossils have been found within the striated red sandstone canyon walls that surround the road. The byway cuts through a canyon for most of the way and follows the Dolores and San Miguel rivers. Through the years, these rivers slowly ate away at the soft sandstone creating the flattop canyon through which you'll ride. The Frontier Pathways Scenic and Historic Byway charts a course through an area that was once a true cultural crossroads. These foothills to the Rockies were used by Ute Indians, Spanish and American explorers, fur trappers, ranchers, prospectors and now by visitors seeking stunning mountain views and prairie buttes. The journey takes you from the town of Pueblo and twice through the San Isabel National Forest. As you enter the San Isabel National Forest the first time, the peaks of the Sangre de Cristo Mountains make their presence known through astonishing vistas showcasing their high pinnacles and craggy outcroppings. The ride then takes you to the town of Westcliffe at the base of this range, then doubles back to the southern passage through the forest and ends in Colorado City, where flat-topped prairie buttes jut out from the prairie. Two of the most well-known buttes in Colorado’s prairie stand stark against the flat surroundings, the Pawnee Buttes. Their white and gray striations show the passage of time through geology and give you a view into the height of the original landscape. The ride here is flat and open, and travels through pristine and protected prairie. The Pawnee National Grassland dominates much to the landscape and provide you with a look into exactly the same terrain pioneers encountered in the 1800s. Pronghorn antelope — the fastest land mammal in North America — can often be seen, as can coyotes, prairie dogs and hundreds of bird species. Leadville, the highest incorporated city in the United States, is found along the Top of the Rockies Byway at an elevation of 10,200 feet. As high as this town is, it’s dwarfed by the two tallest peaks in Colorado, Mount Massive (14,421 feet) and Mount Elbert (14,440 feet). This route also crosses the Continental Divide twice and follows the Arkansas River nearly to its headwaters. Mining history is tucked into the scenery along this byway. Millions of dollars worth of precious metal was extracted from the mountains in the area in the 1800s, and Leadville proved to be the silver queen of the Rockies, providing one of the richest silver veins in the state. Due to the high altitude and winter road conditions, this route is only open from Memorial Day to Labor Day. The road rises to its peak at 12,095 feet on Independence Pass. Aspens and evergreens dissolve into each other as a lush valley meanders below, and the surrounding mountains provide jagged lines against the sharp blue sky. The ski towns of Aspen and Snowmass are also found along this stretch of highway. Glenwood Springs is found on the northern entrance to this route and is world-famous for its claim to the largest improved hot springs in the world. Between Glenwood Springs and the tiny town of Basalt, look to the south for a view of the scene-stealing grandeur of Mount Sopris. From the oldest towns to the highest sand dunes, Los Caminos Antiguos incorporates many of Colorado’s most intriguing sites. One of the first towns you’ll venture through is Conejos. Here, Colorado’s oldest Catholic parish still stands — Our Lady of Guadalupe, built in 1858. Continuing along the byway brings you to the town of San Luis, Colorado’s oldest surviving community, dating back to 1851. On the mesa adjacent to town is the spiritually inspiring Stations of the Cross, a string of bronze statues, each representing a moment during Christ’s crucifixion. Nearly 15 miles from San Luis is the town of Fort Garland, home to Colorado’s oldest military post, constructed in 1858 and once commanded by the legendary Civil War hero Kit Carson. North of Fort Garland are North America’s highest sand dunes — Great Sand Dunes National Park and Preserve.